Join us for DC’s first-ever-in-recorded-history (or at least the past 2 years) COFFEE BIKE CRAWL. 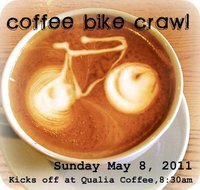 This is happening on MAY 8TH and you can bring your BICYCLE for a morning of local coffee superstars, sunshine (hopefully), and good company. 8:30 – Meet at Qualia Coffee (3917 Georgia Ave NW, just north of Georgia Petworth Metro at Randolf St) Meet at Bike House in the alley that runs between Randolph and Shepard St.
No need to register or anything, but you should rsvp to this invite to get updates via le facebook.